Sophie is my little pumpkin toting shadow. She follows me around the house until I sit still long enough so she can dump out her candy and take inventory of her goodies. 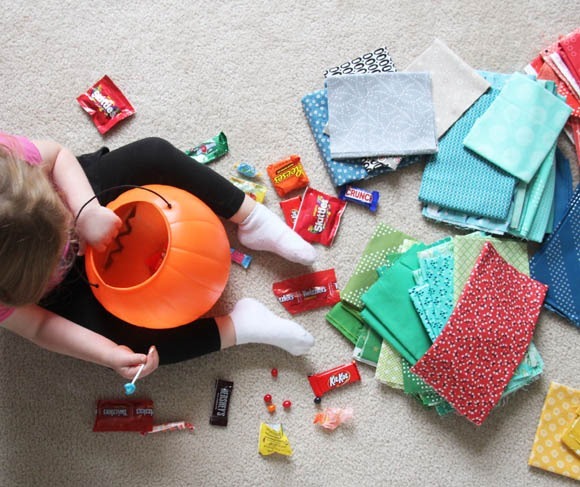 She’s sorting her candy…and I’m sorting fabric into a pile of fall-ish favorites for some quick décor projects. I’m finishing up my Metro Hoops Quilt today too. My blocks ended up wonky…and not the good kind of wonky. 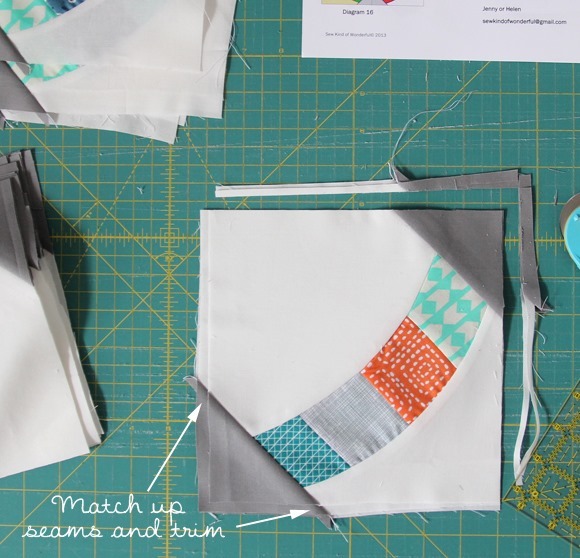 Luckily the pattern has some great squaring up instructions…and to speed it up I squared up the first block perfectly using the instructions, then laid it on my other blocks a few at a time, matched up all my seams and cut. Using the first block as a guide saved me SO much time! Now to get dinner started and get some healthy food into my kids before the Halloween candy coma starts tomorrow! I love the photo of kid candy alongside quilter candy. Great pictures. Here comes the candy coma, I'm ready!! That quilt is going to be gorgeous! I like the colors you are using. I was considering Metro Hoops but just just bought Metro Twist. It looks like a great scrap buster. I'm counting on wiggle room to square up blocks! Cute shadow by the way. Allison- I can relate to wonky! I threw 2 blocks away from my Wallflowers quilt along. I wasn't paying attention to your instructions. I am on my way though. I did one good block today. Hope the other 8 go as well. Enjoy your munchkins tomorrow! Great idea about stacking the blocks for trimming after the first one. I'm going to try that with my Metro Hoops. It sounds like it will save time! Saw the photo you posted on IG and loved it. Great color combo. Looking forward to seeing the finish of this.